Today we celebrate the Saint of the Little Way, a cloistered nun who died at the age of only twenty-four, having led a very simple and hidden life. After her death and the publication of her writings, she quickly became one of the best known and loved saints. She has never stopped helping the simplest souls, the little, the poor, the ordinary, and the suffering who pray to her. She has also illumined the Church with her profound spiritual doctrine. In 1997, Pope St. John Paul II declared her a Doctor of the Church. Pope Pius XI called her the star of his pontificate and the Venerable Pope Pius XII said of her that she had rediscovered the heart of the Gospel. Pope St. John Paul II also described her as an expert in the scientia amoris, the science of love (Novo Millenio Ineunte, 42). She expressed this science, in which she saw the whole truth of the Faith shine out in love, mainly in the story of her life, The Story of a Soul, published one year after her death. It is a story of love, told with authenticity and simplicity and a burning desire for truth. This LOVE has a Face and a Name: it is JESUS. We must note that St. Therese’s life was not easy. She lost her mother at the age of four. As a child she was affected by a serious nervous disorder. Suffering was no stranger to her. Soon after she entered Carmel at the age of sixteen, her father began to suffer from a painful and humiliating mental illness. It was said by some that the loss of his youngest daughter to religious life had caused him to become ill. This caused her great suffering and it led her to contemplate the Face of Jesus in His Passion, hence her name in religion: Sister Marie Therese of the Child Jesus and of the Holy Face. Her name expresses the program of her whole life in communion with the central Mysteries of the Incarnation and of the Redemption. The scientia amoris was thus coupled with the scientia crucis, the science of the Cross that in time would be explicated in depth by another Carmelite, St. Teresa Benedicta of the Cross. With humility and charity, faith and hope, St. Therese continually entered into the heart of Sacred Scripture, which nourished her spiritual life. She carried a small book of the Gospels with her at all times. By her example she teaches us to love the Word of God and to enter into a loving dialogue with this living Word. Her spiritual life was also centred on the Eucharist, the Word made Flesh. She said of God in light of the Eucharistic Mystery, “I cannot fear a God who made Himself so small for me. I love Him. In fact, He is nothing but LOVE and MERCY.” Mercy is Love’s second name and she fully understood and taught that the scope of God’s mercy is universal. On the day of her religious profession she prayed that “no soul may be damned today.” She saw herself as a Bride of Christ and Mother of Souls. Indeed, she had entered Carmel to save souls and to pray for priests. Though she died at only twenty-four, her spiritual legacy continues to enlighten the Church. We too can take her as our model as we live out our commitment to the Gospel, learning from her the scientia amoris and the scientia crucis; without which we cannot hope to progress along the path of authentic Christian discipleship. 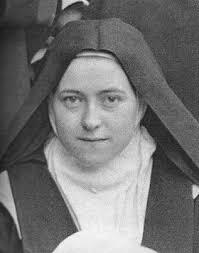 From St. Therese we can all learn to exercise a spiritual maternity or paternity and likewise pray that “no soul may be damned today” or any day. St. Therese died on 30 September 1897, saying these simple words: “My God, I love You.” May she continue to guide us along her Little Way of trust and love, of spiritual childhood. Truly she rediscovered the heart of the Gospel, for our Lord says: “Unless you turn and become like little children, you will never enter the Kingdom of Heaven” (Mt 18:3). On her feast day, listen to Le cantique de l’amour de Sainte Therese (The song of love of St. Therese).